A steaming bowl of fresh cooked oatmeal is the perfect way to start off your day. A great way to ward off heart disease and diabetes. Whole grain products contain dietary fiber and have been shown to reduce the risk of high blood pressure and heat attack. This product is processed in a facility that handles other products and therefore may contain traces of peanuts, tree nuts, milk, gluten, soy, sulphites, and sesame seeds. Place Olympic Quick Oats & fruit in a bowl. 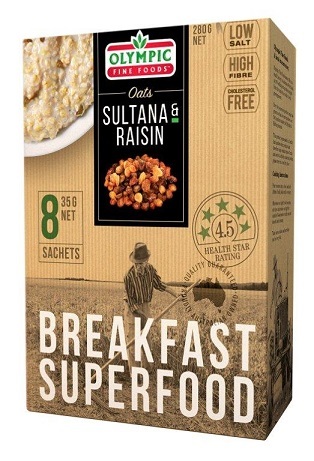 Love our Breakfast Superfoods – Sultana’s & Raisins product?